If you mean the "No, you move" speech, I think it went up as part of One Perfect Moment Week. 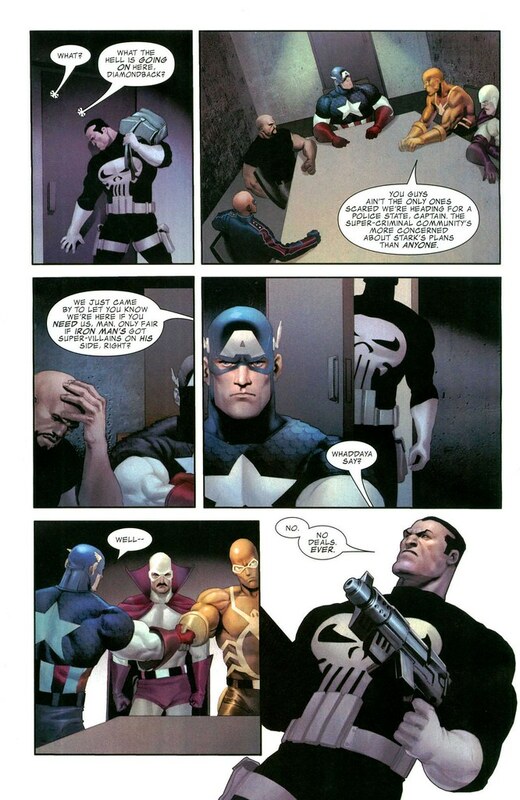 "So... the Punisher killed two super-villains and then let Captain America beat him up just to prove a point? Anyone know the point?" 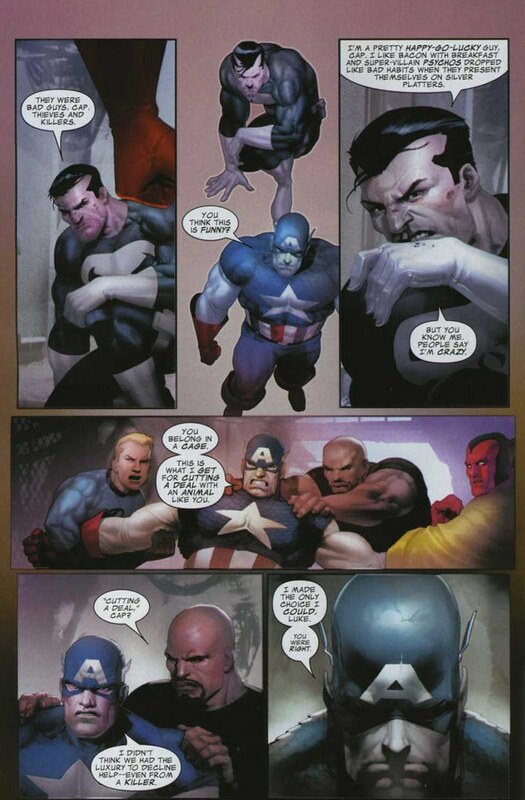 I think PunisherMAX was on the right track--he was trying to show through inaction that he was the more rational person not to deal with criminals then Steve, who was beating up a guy who's hands aren't even up. Wow, isn't this kinda soon for a retcon? Maybe? It's an interesting scene contrast. Frank is unstoppable unless you kill because he'll never stop. If you haven't, check out Punisher BORN. For the fuckedness of Frank before the Punisher years. 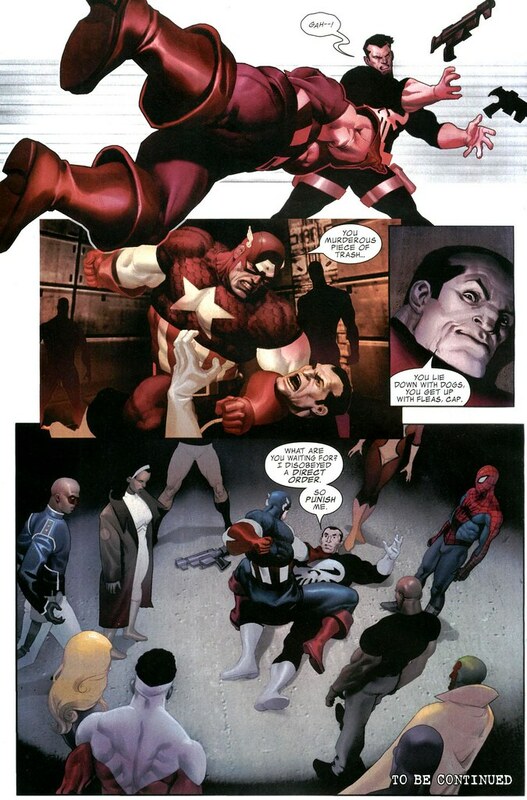 Okay, so who read Castle saying "Punish me," and immediately thought of Cap dropping him down an elevator shaft? I thought, "Oh, Frank, if only you could be comfortable and open with your own sexual impulses." Far worse to kill in cold blood, and in the MU, that's not really an easy question--villains become heroes and back again a lot. It's more fluid and ambiguous, unlike the DCU where "good vs. evil" is more like a cosmology. 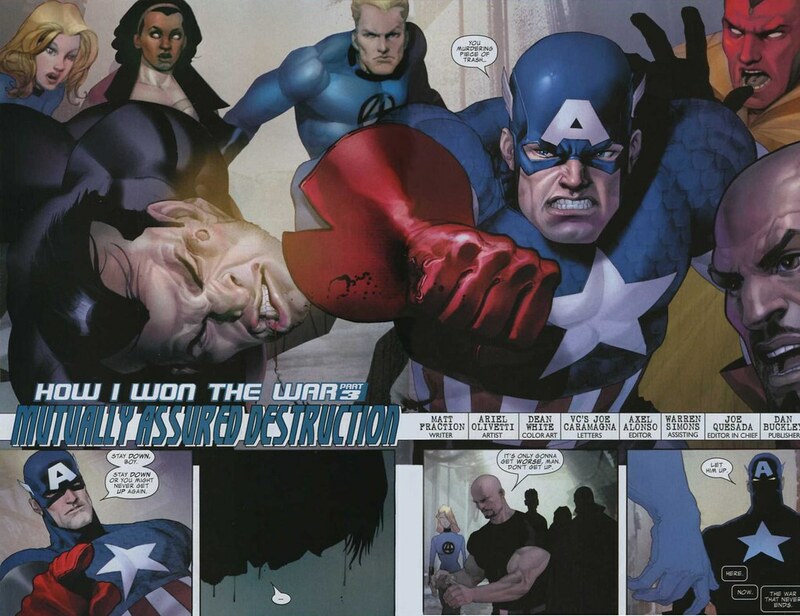 So Cap working with them under these circumstances is not wrong, though he didn't look too keen on the idea anyway. Also--Goldbug and the Plunderer? I can't imagine either of them did anything deserving that. Except maybe their choice of outfits. 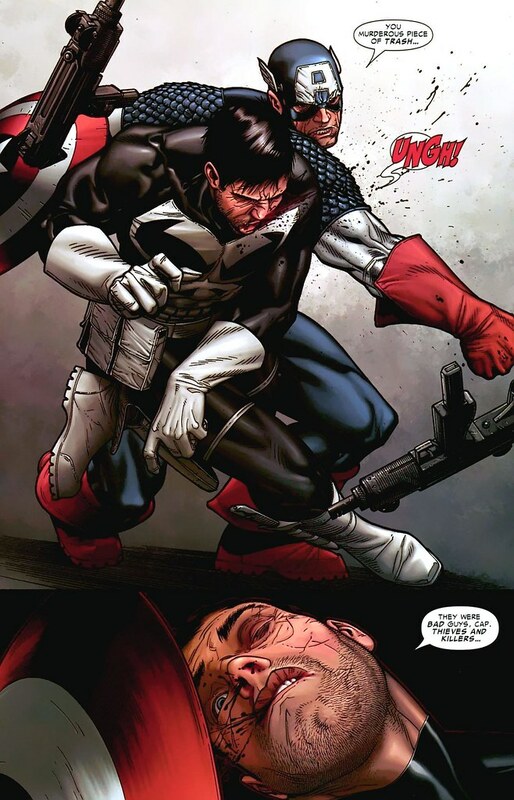 The Punisher is not a hero, though he may do things that serve the cause of good. He's Batman if the heart had been taken right out of him, but with Vietnam experience and military training. Or Rorschach had he been a Marine once. Ennis got the character right because he wrote him as a man who knows his soul is dead. He also didn't treat him as a "hero." Nor "likeable", more like "interesting". And somewhat grotesque. He's that guy who stands at that point all "superheroes" try to stop short of. The best Punisher stories are ones that are chilling, rather than thrilling. At best, it seems to me, he should never seem cathartic, and should inspire, at best, mixed feelings. Otherwise he is a rather malignant character. The Punisher is, in many ways, an American version of Golgo 13. Except cross out 'emotionless' and write in 'guilt-ridden crazy'. First off, thanks for posting this. Second off...wow, those are TWO very different accounts of the exact same event. 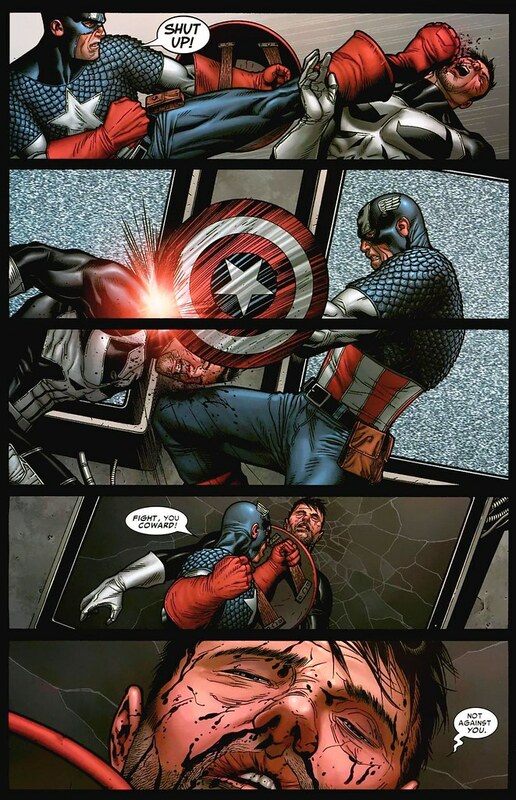 The first one rings a lot more true for Cap than the second one. "He knows I WON." Huh? 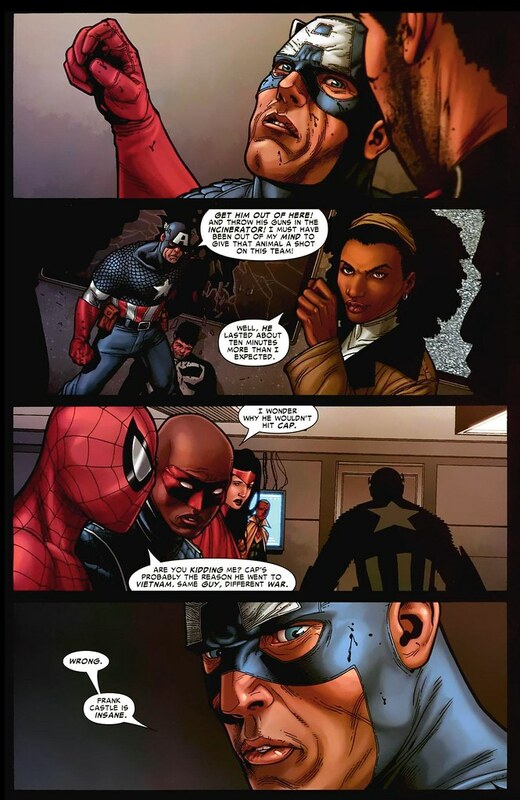 This kind of thing irritates me and you see it a lot in modern Marvel. A character does something in a "big" book that pisses off whoever writes the character in a "lower-tier" book, so the aggrieved writer gets permission from his editor to write a reaction to the offending scene. What inevitably happens is that the offending scene is re-written in a way that ludicrously sentimentalizes the character. Either he gets ton of new dialog that exposits what he was really thinking, or the actual sequence of events is totally changed to make the character look better. It's far more tedious reading than the writer just acknowledging that things happened the way the audience saw it the first time, then moving on express the character's POV on things in a manner that might be slightly more subtle than a brick to the face. The Punisher War Journal version of events reads more like the way the Punisher might rewrite it in his mind as he's walking away from what actually happened in the first version. "And then I'd be all like, 'What about THIS, MR. Flag Man?' And then he'd say, 'Dag, you're right, soldier. I am hecka molded.' And he'd give me a medal -- which I'd toss back in his stupid face!" That's exactly what I was thinking. 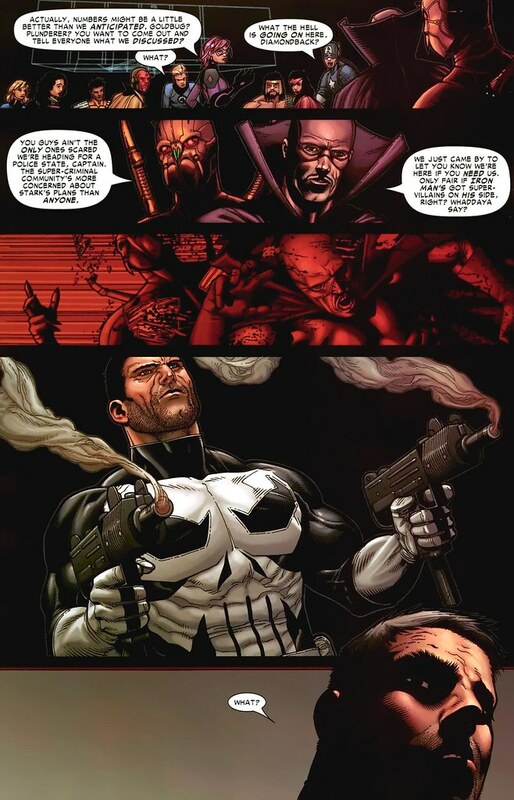 Same scene, re-written to make the Punisher look really, really awesome. I like the first version a lot better. It seems more in character for Frank to just casually blow someone away instead of milking the scene for a dramatic line - he's like 'yeah, I killed 'em - so what? They were crooks.' Also, it doesn't attempt to justify what he did - the latter version all but says outright 'ah, the others are wimps; Frank's the only REAL man in the room', which I find offensive. And as for the 'what's worse' question, I would say Frank's blowing them away, definitely. I mean, it's not as simple as 'they're crooks, therefore evil' - the MU has a long history of crooks reforming and working on the side of the angels. Look at the Porcupine - he was a villain for pretty much his entire career, but he had a change of heart, died fighting the good fight, and now his armor is on display in Avengers Mansion, labeled as belonging to an 'honored foe'. Look at Baron Zemo - he was a modern=day NAZI, forcryin'outloud, and even he is more or less a good guy these days. Hell, look at this group here - Diamondback was a member of the Serpent Society, if I'm remembering correctly, but she's changed her spots, too. Moreover, Cap's men themselves are criminals here - they're outlaws, defying a legal mandate. Goldbug and the Plunderer are low-level supercrooks offering help - they're not asking anything in return, they just want to help. Everyone's in the same basket here - blowing them away for being crooks is not only morally shaky and so forth, it's outrageously hypocritical. The Punisher did say they were "thieves and killers," meaning they were more "regular" bad guys instead of just being against the Registration Act. The Fraction story was more like the Punisher telling Captain America "This is what you WANTED me to do, so don't pretend otherwise." 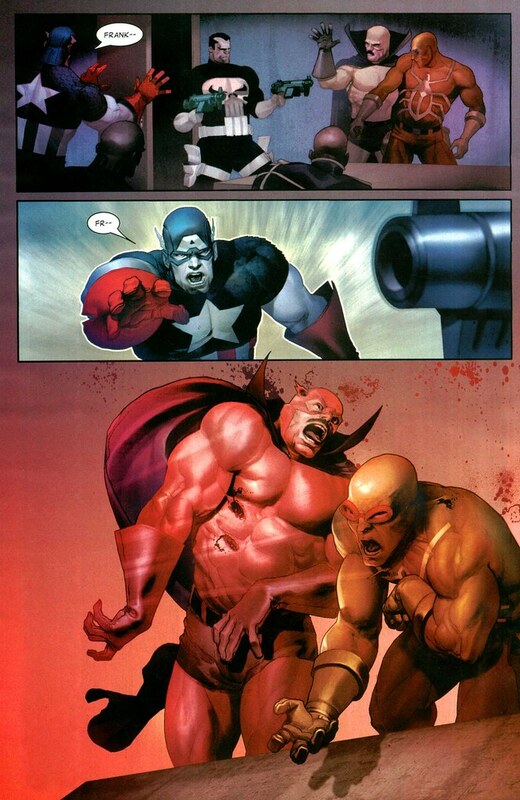 Of course, I doubt this was remotely what Cap had in mind. BUT... What Frank was saying wouldn't bother Cap so much if it wasn't a little bit right.